Need some gift ideas for the holidays? There’s still time to make a few. How about pine sachets filled with all too fragrant pine needles. 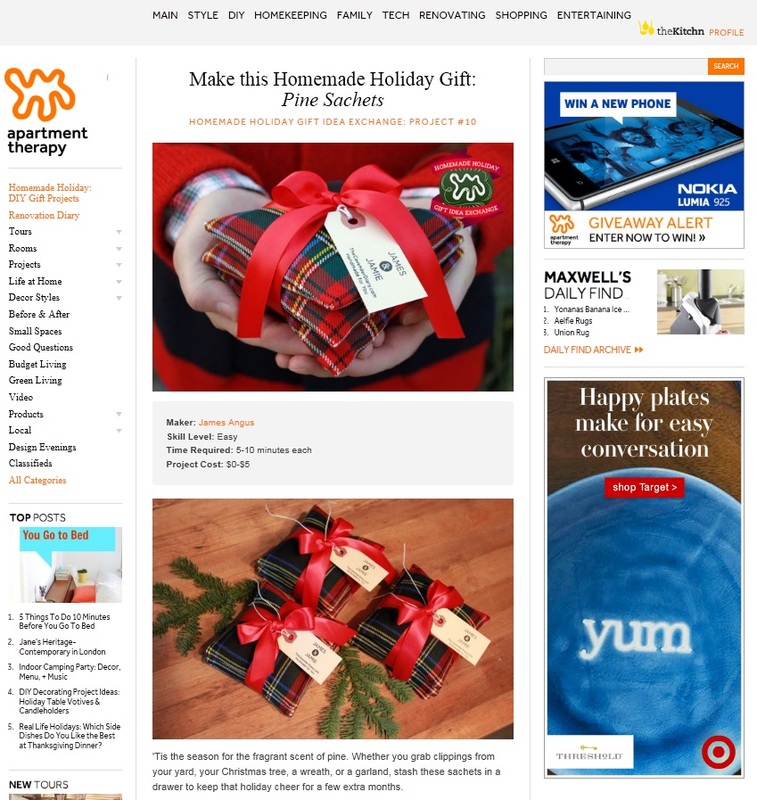 That’s right, Apartment Therapy is suggesting OUR pine needle sachets that we made for impromptu gifts last year. I just couldn’t bear to trash any of those fallen pine needles, I had a pile of tartan fabric scraps staring me in the face…..and the rest is history. OK, those are adorable. Your so crafty and I TOTALLY understand why you hang on to things! I mean, we might need them. Obviously you did need that fabric…10 years later or not! Wonder where we could find something like pine needles or some other great smelling things this time of year so we could make these for under the tree? Suggestions? There are random pine trees all over my neighborhood, that could stand to loose a branch or 2, or you could always buy a pine, or cedar plant from H-Depot and strip the needles. Rosemary would work well too. YYummmmm. I’ll have to check out my town for pines! I do know where lots of rosemary is, however, i like pine better. Keep up the great ideas and great blog! Okay, I do love the homemade Christmas ideas, and I love the fact that the people at Apartment Therapy are big fans, but hold the phone, have you seen the Gather and Build post about the ACE hotels? Two words, galvanized pipe! You have got to check it out. The light fixtures are to die for, but you guys are so on the ball, you’ve probably stayed in one of the hotels, and I’m late to the party! We haven’t stayed in one yet, but I am familar with the bed blankets..LOVE..see them on Pinterest all the time too. Congrats on the feature! I made some mini sachets to include in my Etsy orders during the holidays last year. I used those seasonal holiday tea bags – ginger, cinnamon, etc. They smell really spicy and festive!